Just when I had finally gotten a blog going, as I had planned for some time, I let myself get off track. Why? So, without further ado: the last installment of awesome children’s Christmas toys 2012! The third stuffed toy I made was not from a drawn picture, being that the recipient (K. W. 2) of this gift is quite young, and I actually had a bit of a pattern. 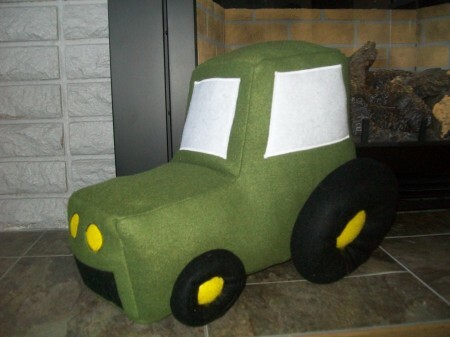 Back when I was searching for a tractor afghan pattern (which I never found) for K. W. 2’s blankie, I came across this adorable pattern for a crochet stuffed tractor from Look At What I Made. I planned on making one to go along with the afghan, but ran out of time. When I started making the Christmas toys for his brothers, I remembered the toy tractor and thought I’d get back to making him one – but with a twist. 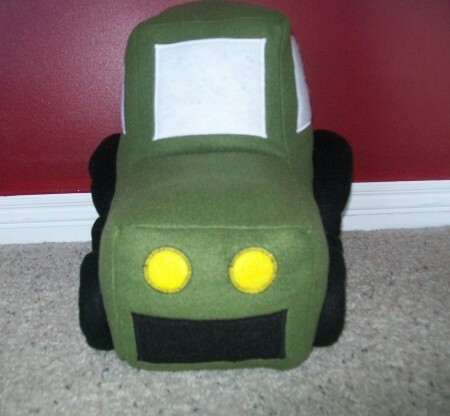 Instead of following the pattern and making it in crochet, I sewed the tractor from fleece! The tractor pattern is made up of just a few basic shapes. Rather than crochet the shapes out of yarn, I just cut them out of fleece fabric. Exact dimensions aren’t given in the pattern, but it wasn’t too difficult to freehand cut out a piece (I think I started with the side) and cut the others to match up when sewn together. I cut the details out of felt and sewed them on all around with a satin stitch. The wheels were simply circles sewn together with a band in between. I attached them to the tractor body by hand-sewing around the yellow rims to make them poofy. Easy peasy! Here it is carrying the whale. I tossed the whale up there after I had them both finished, and it reminded me of a Jeep with a surfboard on top. 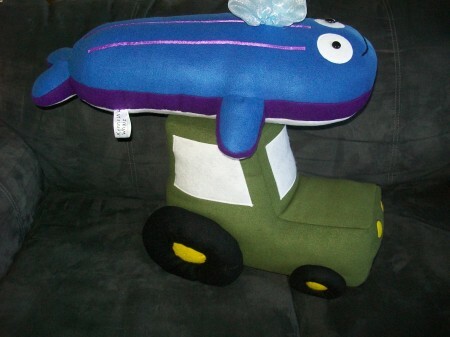 A tractor carrying a whale… it just makes me laugh. Somehow it suddenly became February! What happened? I was excited, yet intimidated, to get started on this projectile of a project. B. W. added some great detail to his drawing, which resulted in 34 windows! Luckily my awesome husband bought me an embroidery machine last year, but it still took a few days just to get the embroidering part done. 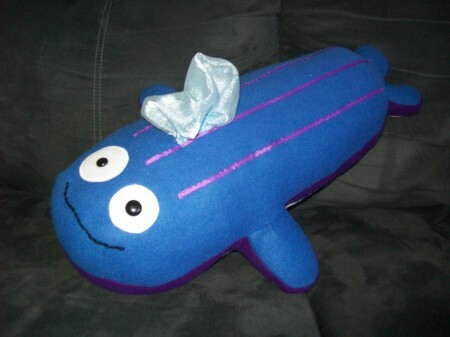 This toy is made of flannel, rather than fleece like the whale. I thought it would work better for a toy more likely to be thrown than hugged (not that it isn’t huggable :)), and that the windows and other details would show up better. I made the “fire” at the end of the rocket out of some great sequined fabric I’ve had for ages. It was great to finally find the perfect use for it. 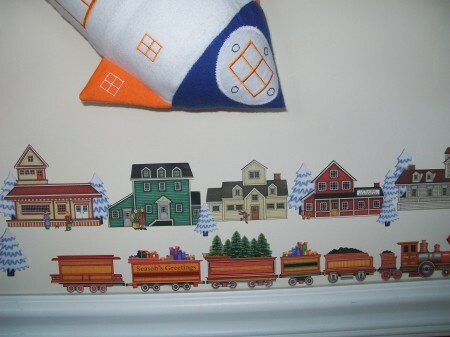 Run, little Christmas wall-village people! Run! I was anxious to find out what he thought of my flannel and fiber rendition of his drawing. His mom tells me he thinks it’s perfect. I couldn’t be more thrilled! A Whale of a Time this Christmas! Wow! I can’t believe I haven’t posted about my favorite Christmas project for 2012 yet. It was so hard to wait until after the holidays, and here it is nearing the end of January already! We had a whale of a good time this Christmas, and in more ways than one. A few months ago I found out about Child’s Own Studio, and thought it was just about the most adorable thing I had ever heard of. 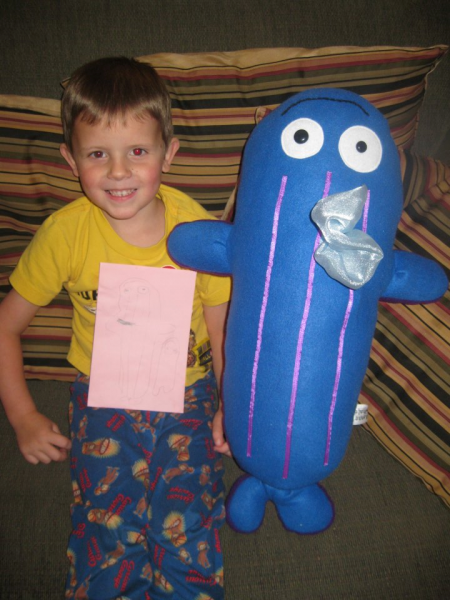 Wendy makes customized toys for kids based on their own drawings. I hadn’t really made toys before, but I so wanted to give it a try. I have a few little nephews on my husband’s side of the family, and I thought I’d try making some “stuffies” for them. I figured it would be a win-win; I’d get to try my hand at kids’ toys, and they would (hopefully) get some fun, customized Christmas presents. 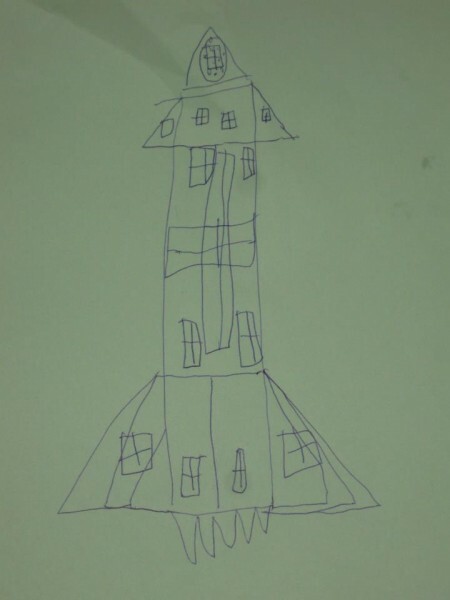 K. W. (5 years old) enjoys drawing whales. 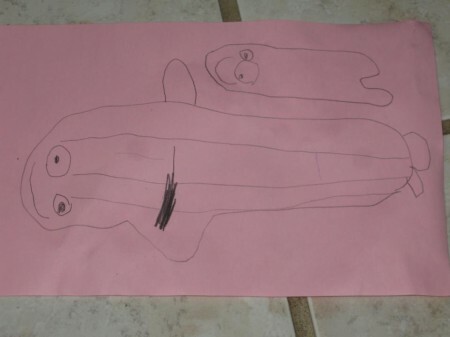 His mom sent me a few of his drawings, and I just fell in love with his fantastic version of these sea creatures. I pictured them having white, fuzzy tummies (for some strange reason! ), so I used furry fleece for the tummy and anti-pill fleece for the rest of the body. The eyes are felt with buttons in different sizes to be accurate to the drawing and preserve this blue beluga’s great personality. 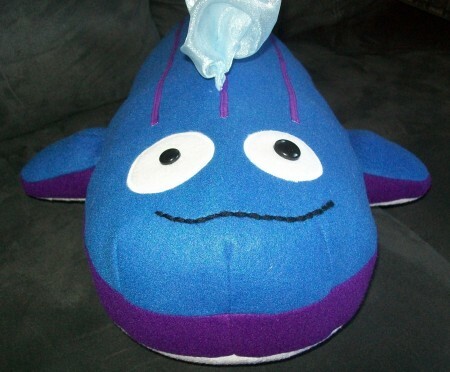 I used purple ribbon for the stripes, and stitched on the mouth by hand. The spout was a tad difficult to figure out. I wanted it to stay soft and huggable, but also look water-like. I ended up using some chiffon left over from a dress. It’s probably not common in kids’ toys, but it did the trick! Look familiar? I sure hope so, as that was the point! 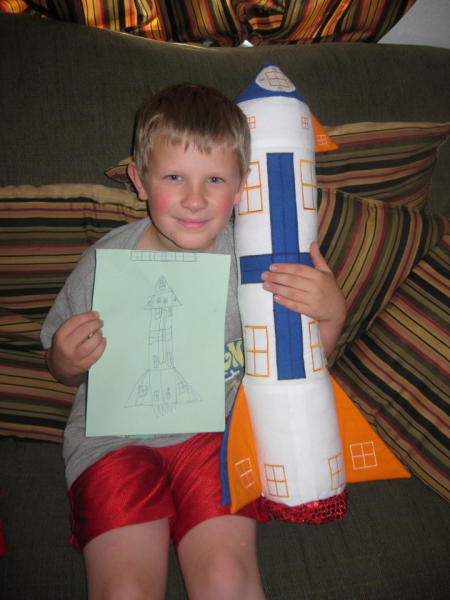 And here’s my happy nephew with his drawing and his new straight-from-the-page stuffed animal. I hope he enjoys it for years to come. Our pal Wonky also makes a great pillow! 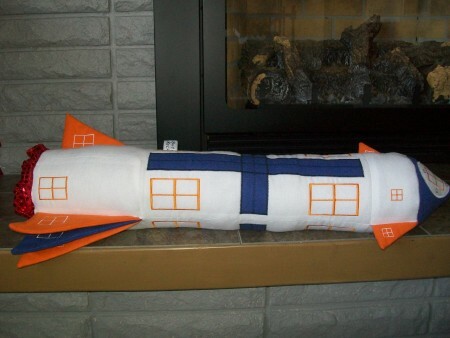 Stay tuned for two more toys I made for my nephews, as well as my other crafting projects for Christmas 2012 gifts. I’m really behind, so I hope to post about them soon!